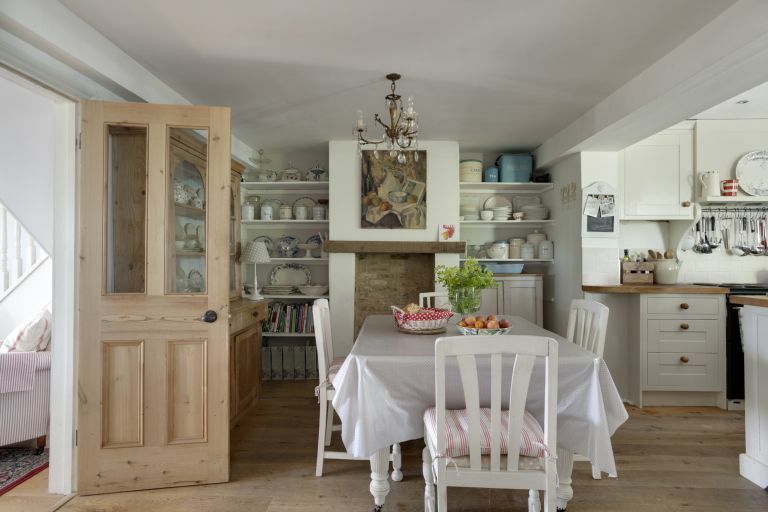 This project reveals how to restore and clean old timber doors, fill holes, cracks and gaps, refinish the wood and fix new ironmongery. Over time, wood doors can be tarnished by ingrained dirt and grime from dusty building work, sticky fingers and pets’ paws, and become marked from bumps and knocks, but they can be brought back to life with good, regular maintenance. Follow our expert step by step guide to restore your wood doors. Need advice on painting your whole house, outside and in? Use our essential guide for all the info you need. Tip: Before applying new cleaning or maintenance products on a wooden door, always try them on an inconspicuous area first to test colour, compatibility and end result. Wearing gloves pour some wax and polish remover into a bowl. Take a pad of fine steel wool to swab the surface with the solution working with the grain. Wait for a few minutes and while the wood is wet use a clean, cotton lint-free cloth to wipe away the dirt and grease from the wood door. Keep turning the cloth to reveal a clean face so that you wipe the dirt off rather than rub it in. Wait for 24 hours to allow the wood to dry before applying finishing oil. The screws used in the construction of this timber door were counter-bored and the heads should have been concealed with plugs of wood. The holes are deep, so for a neat finish we are using wooden dowelling to make plugs. Choose a short length of a slightly wider diameter. Clamp it safely in a workbench or a G-clamp. Taper it to fit using a plane, file or coarse glasspaper. Ensure the hole is clean and apply glue liberally. Knock in firmly with a mallet. Wipe away excess glue before it dries – a damp washing up sponge is ideal. Leave the glue to set completely. The peg can now be sawn off flush with the surface. A fine-toothed handsaw with its flexible unsupported blade is ideal for this job. Use the other hand to hold the blade level. Protect the wooden doors by placing pieces of thin card beneath the saw teeth. Rub smooth with a piece of abrasive paper wrapped around the end of a pencil. Apply wood filler to holes, cracks and gaps in the timber door. Always replace the lid firmly on the can. If it’s a bit dry a little water can be mixed in to make it more pliable. Wax filler sticks are useful for repairing surface damage. They are available in a range of different shades to match the wood you are working with. Push firmly in with a filling knife. The wax becomes more workable if kept at room temperature for a few hours before use. Using a brush, cloth or plastic scouring pad, apply an initial coat of finishing oil to nourish and enhance the natural colour of the wooden doors. Allow to penetrate for 10 minutes then wipe off any surplus oil with a clean cotton cloth. Apply further coats at intervals at no less than 5 hours. The more coats applied the higher the sheen and the more durable the finish. Always wipe off excess oil. If allowed to remain it will become sticky and attract dirt. We have taken off the cheap, machine-made hinges that had become distorted and rusty. They are being superseded by a pair of handcrafted tee hinges, which are perfect for traditional wood doors. Fix onto the timber door first using the original fixing holes if possible. Alternatively hold firmly in place and locate new holes with a bradawl. Screw to door frame fixing with just one screw in each hinge. Open and close the door a few times. Make any adjustments and drive in the remaining screws. This brass latch is heavily tarnished having endured many years of neglect. Apply masking tape to protect the wooden doors from marking. Rub the metal with a soft cotton cloth soaked in brass and copper cleaner to remove all traces of tarnish. If it’s proving very stubborn pour some cleaning fluid in a bowl and use a pad of very fine steel wool (0000 grade) to gently rub away the discolouration. Rinse well and dry with a soft cotton cloth. Apply brass and copper polish with a clean cotton cloth, rubbing vigorously. Wait a few minutes and buff to a shine. To keep brass looking good for longer rub the cleaned and polished latch with a good quality wax polish. Make a card template of the latch and keep it with your polish – that way you can polish the latch without having to worry about spoiling the door. An occasional application of polish on the hinges will keep rust at bay too.